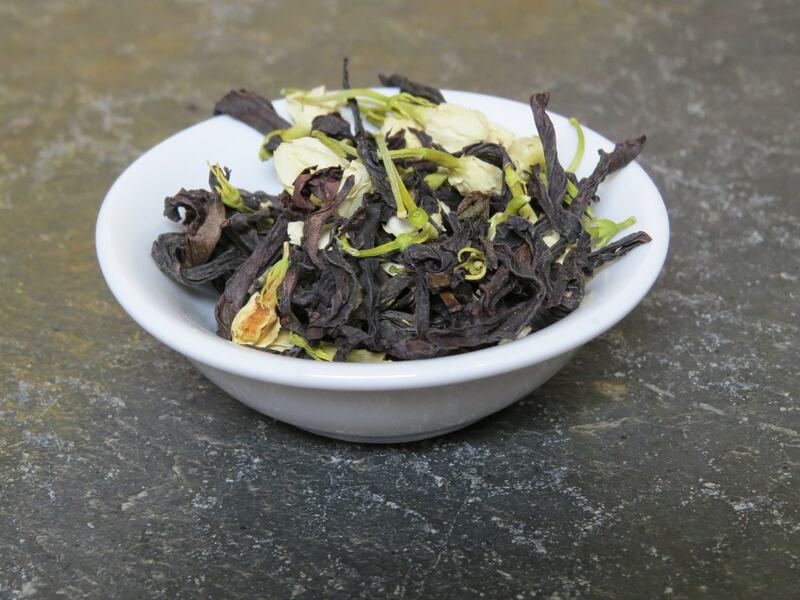 The oolong teas we have created lately are a bit more work-a-day than many of our teas. When I first began working with tea, it was primarily about the herbs, putting all the study I’d done into play as helpful tisanes for health and well-being. Mister Tea pointed out to me several times, as I began my foray into creating tasty blends fueled by more than “I want this set of tastes back,” that being intimidated was goofy, given my skill with cooking, but it was still hard. As we’ve done more and more, we’ve been adding more types of tea to our ingredients toolbox – mostly by request. Oolong is our most recent addition, and I was actually quite gleeful after our first couple of tests. Here was a black tea that wouldn’t overpower more delicate fruit tastes – and would likely be easier to pair with flowers, as well. Jasmine was a known love of one of the customers who had requested oolong tea, so it was an easy choice for one of the first set of oolong blends. I have always loved the scent of jasmine, and our work with tea increased my love of the taste, as well as teaching me that you can blend it with so many more things than I had initially imagined. Once I discovered the translation for the name of the tea, I became fixated on attaching most of our oolong blends to dragons. Given the resonance jasmine has for me and for some of the people I polled regarding it, ‘Dragon’s Enlightenment’ seemed an excellent name. 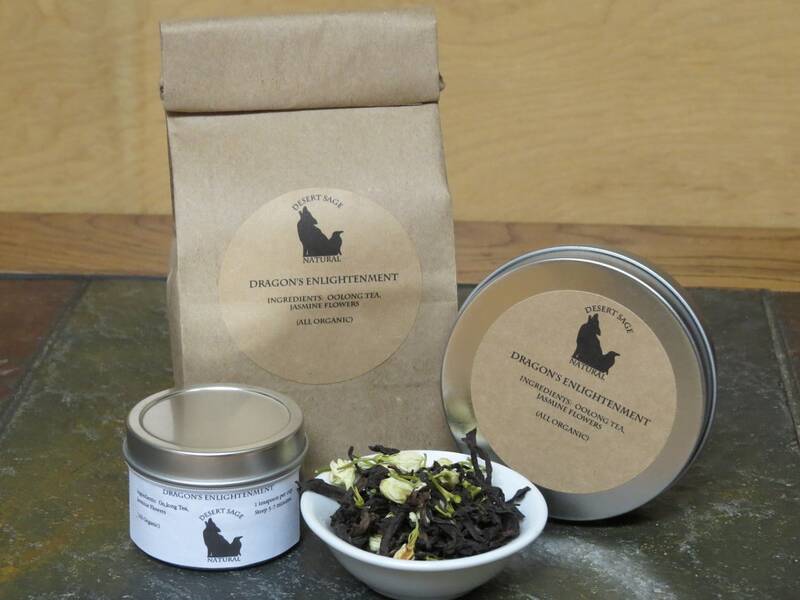 This entry was posted in Black Tea, Floral, Simply Tasty Teas and tagged Black Tea, Dragons, Organic Floral Tea, Organic Jasmine, Organic Jasmine Tea, Organic Oolong Tea, Organic Tea, Simply Tasty Teas, Wu-yi Rock Oolong Tea by DesertSage. Bookmark the permalink.